Ferienvilla mit Erfrischungspool und Blick auf das Meer und die Berge. Ruhige Lage, 5 Gehminuten zum Strand und 2 Minuten bis zum Dorfplatz. Eine schöne, geräumige Ferienvilla für Selbstversorger an der Westküste von Rhodos. Geeignet für Familien, Gruppen und Paare. 3 große Schlafzimmer für bis zu 6 Personen. Privater Garten und Erfrischungspool. Aussicht auf das Meer und die Berge, nur 5 Gehminuten bis zum örtlichen Strand. Ideal zum Kitesurfen, Wandern, Radfahren oder als Basis, um die Insel zu erkunden. Nur 20 Fahrminuten vom Flughafen und 30 Minuten von der Stadt Rhodos entfernt. Die Bushaltestelle ist nur ein paar Minuten entfernt, mit häufigen Busverbindungen. Wir können ein Mietfahrzeug zu günstigen Konditionen und unkompliziertem, gutem Service vermitteln. Das Ferienhaus wird professionell von englischen Haushältern betreut, die in der Nähe leben. Badezimmer im Erdgeschoss mit Badewanne und Duschkopf, Toilette, Waschbecken (Waschmaschine im Hauptbadezimmer). Im Badezimmer in der oberen Etage gibt es eine zweite Toilette und ein Waschbecken. Offene Küche/Essbereich. Ausgestattet mit Herd, Ofen, Kühlschrank, Gefrierschrank, Mikrowelle, Geschirr und Besteck. Kühltasche und Kühlakku für Ausflugstage. Rauchen im Ferienhaus ist streng verboten. Ankunftszeiten sind flexibel und wir versuchen unser Bestes, Ihre Flugzeiten zu berücksichtigen. Wir haben zu dritt eine wundervolle Woche im "citrus house" verbracht. Die Fahrzeit vom Flughafen beträgt nur etwa 25 Minuten und dank der guten Beschreibung ist das Haus leicht zu finden. Die Lage bietet sich an, um von dort aus Tagesausflüge z.B. nach Lindos oder Rhodos Stadt zu unternehmen. Die Küche ist komplett ausgestattet, alles war sauber und hat funktioniert, die Klimaanlage hat uns abends sehr gute Dienste geleistet. Die Schlafzimmer verfügen über ausreichend Stauraum und die Betten sind mit sehr guten Matratzen ausgestattet. Es gibt frische Handtücher, Bettwäsche und ein Telefon mit allen wichtigen Nummern für den Notfall. Thankyou for your lovely review of The Citrus House. We are delighted you enjoyed your stay and hope we can welcome you back again in the future. We stayed at the Citrus House for a week in the middle of tourist season. Fortunately in Kalavarda it does not feel crowded at all. Instead we relaxed at the private Mini-Pool, had a great time at the nearby beach, where you get sunbeds and a place in the shade for free and ate at secluded Tavernas. The villa itself is very beautiful and well thought about. You find absolutely everything you might need. The beds are comfy, everything is clean, the interior is very nice and the information about the region, that they have stocked in a guestbook are helpful too. Thanks once again for choosing our villa and for your lovely review. The Citrus House was quite easy to find and the house was clean and fortunately the fridge was equiped with everything we needed for first breakfast - thank you for that. Steve was very helpful and friendly - we felt very welcome. We were a little upsed that the third bedroom turned out to be a space behind the bathroom whitout window or door. The description on the homepage was "3 bedrooms" - but the kids accepted that. For a family of five was the table on the balcony a little too small and only four chairs but we dealed with it by taking the table and chairs form the terrasse and so we spend great evenings on the balcony with a fantastic view. For me as a busy mum would have been a dishwasher a great help in the kitchen. Rhodes is a great place to be and we discovered the whole island by car. 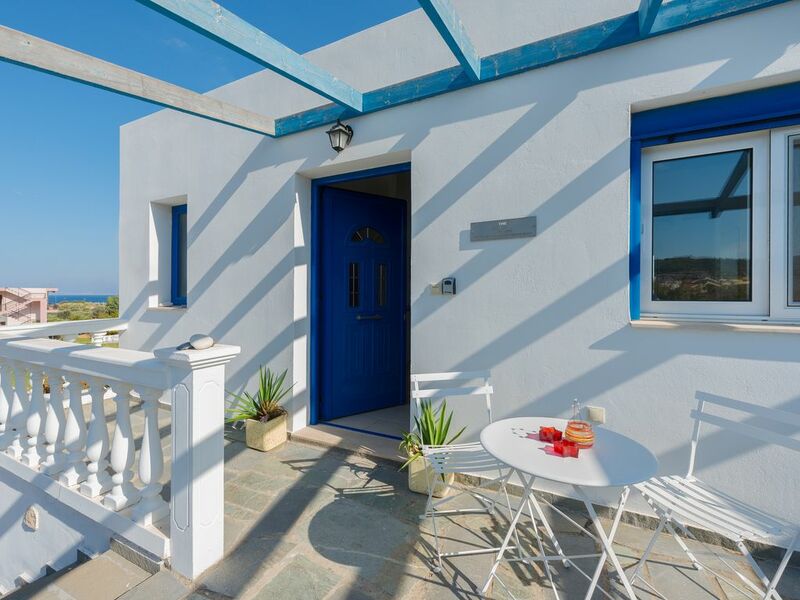 The citrus house was a great homebase - and the wonderful seahouse taverna at the beach. Fabulous food. I could absolutely recommend the villa - but only for families of four if they are like us and love cooking and sitting together. When you love to stay the days out and have lunch or dinner in a taverna, you can fill the villa with up to six people. Even if I had bad luck (slipped on the stairs and broke my ellbow in the second week of our stay) I would love to return to Rhodes. Hi Nina, thanks for your feedback. I'm delighted you enjoyed your stay at The Citrus House and loved the island as much as we do. I'm sorry you was disappointmented with the third bedroom, however we have never had a question about it and as you say it's great for children as it saves them being woken by the sunrise. I'm sure you'd agree it is a spacious and cooler room as the sun doesn't get in yet still plenty of light as it is open plan. A dishwasher would be lovely I agree, also as a busy mum :) Most guests only really eat breakfast and maybe prepare lunches on the odd occasion then eating out on the evening so it's not something thats ever been raised. I have taken onboard your comments and will look at addressing what we can. Thanks very much and I hope we can welcome you back in the future. A very relaxed place to stay and enjoyed exploring Rhodes. On a negative note, a proper shower not just a hand held shower head to wash down with in a bath without even a shower curtain would have been better and the plunge pool had a lot of gravel in it, feel it should have been cleaned before we arrived, but overall a good place. Karen has thought of everything with this place. It's a great space with a lovely balcony and garden in an authentic Greek village. Quieter side of the island and wilder sea, perfect for kitesurfers. Easy to get to from the airport and helpful maintenance man Steve helped us with an inexpensive taxi to a wedding. Thanks so much for your lovely review. I'm so happy that you love the place as much as we do. I hope we can welcome you back again in the future. Please do spread the word, you can earn yourself a discount of your next stay with us. Very nice house, not far away from the beach. The village is very typical, no many tourist and the Greeks are very friendly. The villa is a terraced house, so you have neighbours (we didn't read it and we think that it's an important information). Thanks for your lovely review. I am so pleased you enjoyed your stay in our villa. Sorry you didn't know there was neighbours, I hope they didn't disturb you too much. Yes the house is semi detached and maybe I need to note that on the description. Thanks for staying in our villa and I hope we can welcome you back in the future. In Rhodos gibt es alles, was das Herz begehrt, ob Sie Entspannung oder den Adrenalinkick suchen - hier werden Sie fündig. Das Dorf Kalavarda ist das ganze Jahr über belebt, da es nicht ausschließlich vom Tourismus abhängt. Hier werden sie vor allem mit Einheimischen im Restaurant sitzen. Der Dorfladen bedient sämtliche Grundbedürfnisse, falls Sie sich jedoch für Ihren gesamten Aufenthalt eindecken wollen, gibt es 2 größere Supermärkte, nur 5-10 Minuten Fahrt entfernt. Außerdem gibt es Fischläden, Fleischer, Obst- und Gemüsegeschäfte und Bankautomaten in kurzer Entfernung. Der örtliche Bäcker liefert täglich im ganzen Dorf aus (außer an Wochenenden) und fährt hupend durch das Dorf. Wenn Sie ihn hören, halten Sie nach seinem weißen Lieferwagen Ausschau, er bietet eine Menge frisches Brot, Kuchen und Gebäck an den meisten Tagen. Zur Sicherheit sollten Sie ihn heranwinken, da er meistens in Eile ist (im Gegensatz zu den meisten Griechen, die wir kennen). Changeover Day: I try to be as flexible as possible with bookings and whenever possible I do allow some flexibility with arrival and departure times taking into consideration flights times (especially for families with small children) however this is not always possible. Notes on prices: Book your 2016 holiday now. 25% deposit will hold your dates contact me today for more information. Discounts available on bookings of 10 days or more.